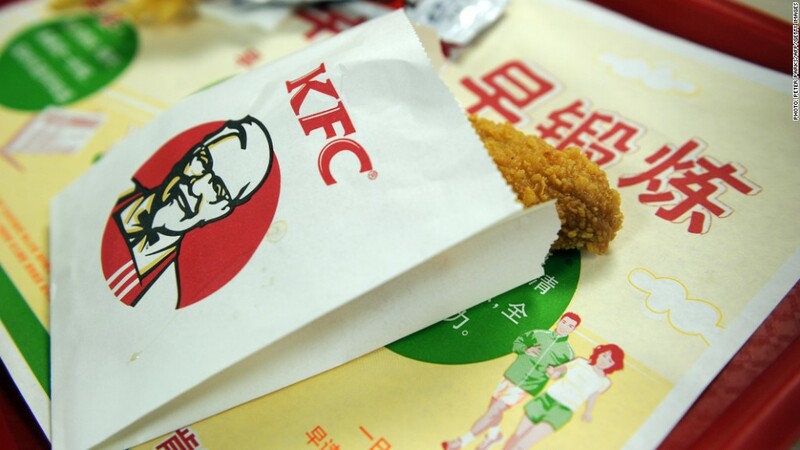 Yum Brands just can't shake off its China troubles. The fast-food giant said Wednesday that same-store sales in China dropped 20% in the first quarter, as it continues to grapple with the fallout from a food safety scandal and fears over a new strain of bird flu. The sharp decrease in sales dragged down net income by 26%, from $458 million in the first quarter of last year to $337 million this year. The report topped analyst expectations, boosting Yum (YUM) shares in after-hours trading. Many consumers in China are worried about a new strain of bird flu, which has received large amounts of publicity. Some of those infected with the virus had recently come into contact with live poultry. The central government has suspended wild bird sales to try to prevent the spread of the virus, although many questions remain as to the source of infection. Dr. Michael O'Leary, the head of the WHO's office in Beijing, downplayed concerns last week about chicken, saying he eats it "everyday." Still, Yum said the publicity has had a "significant, negative impact on KFC sales." "The impact of Avian flu publicity has initially been dramatic at KFC but relatively short-lived," the company said. "In the past, we reminded consumers that properly cooked chicken is perfectly safe to eat, and we continue to do so." China is an increasingly important market for the parent company of Taco Bell, KFC and Pizza Hut. Yum has placed big bets on future growth in the world's second largest economy; it operates more than 4,200 KFC restaurants in China, as well as about 800 Pizza Huts. Last year, China accounted for 42% of Yum's profits. Customers began deserting the restaurants in droves late last year after an investigation by Chinese food regulators found excessive levels of antibiotics and hormones in some chicken products sold at KFC locations. The contaminated chicken was traced to two KFC poultry suppliers, sparking calls for a boycott among Chinese consumers. Even with the setbacks, Yum will proceed with an aggressive expansion of its operations in China, including 700 new restaurants in 2013 alone.